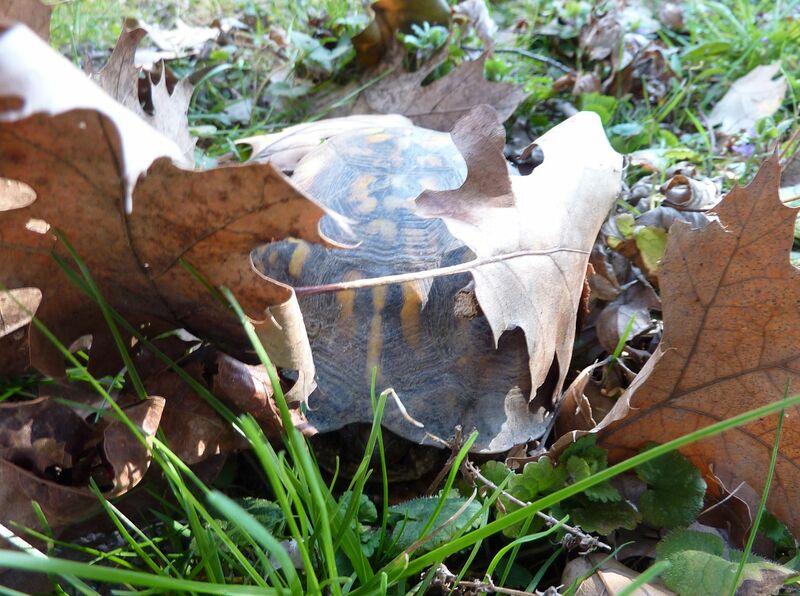 Found an Eastern Box Turtle, Terrapene carolina, out in the yard last week. We don't have the best fences in the world and there's a small ditch I dug for drainage, so there are a few spots where she could have easily crawled on in. It is a girl, or so my mom tells me. Mom's always loved box turtles and she's determined to keep it. We built a turtle habitat and everything for it out under the pine tree. So I get to design a turtle garden. An issue though is I understand female box turtles leave the forest around now to lay their eggs out in fields. The resulting babies live underground for the first few years feeding on god knows what. I had no idea that they actually lived underground most of the time as babies. I knew that they are very rarely found but that explains quite abit. It's great that you're keeping it. At least it will be under good care. Somebody else gets it, it may not be so lucky.